The Junior Choir rehearses every Tuesday during term time from 4.30-6.30pm. The choir learns the fundamentals of what is required to sing as part of an ensemble as well as learning to read and sing in harmony. 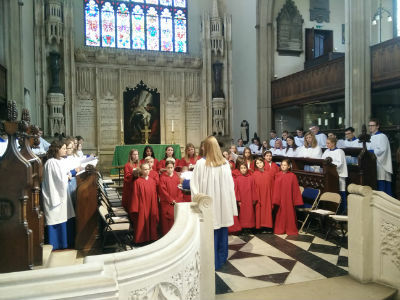 The Parish Junior Choir take part in two All Age Services a term, as well as Christmas, Easter and Summer events. 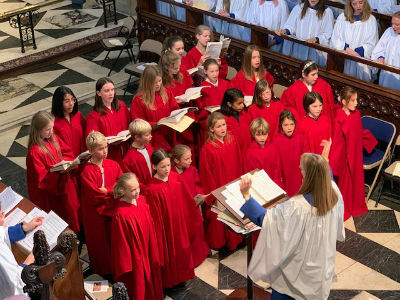 It is led by an experienced professional singing teacher, Emily Calderwood, who strives to develop the children's vocal technique and instil a sense of responsibility for the choir's participation in Sunday worship, while working on a varied and appealing repertoire. Most of the choir are aged between 8 - 11, however we do allow younger and older students to take part. Usually, a short audition is arranged via the choral Director, Ms Emily Calderwood. If interested, please get in touch. Emily and the choir look forward to meeting all those budding young singers!